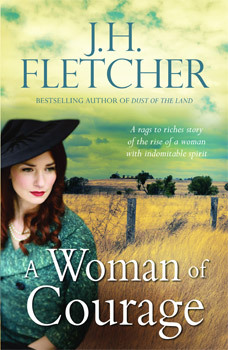 From the bestselling author of Dust of the Land, J. H. Fletcher returns with his unforgettable rags to riches story of a woman of indomitable spirit and a deep, all‐consuming love that changes the course of her life. Fighting her way from humble beginnings in a foster home to CEO of her own highly respected international company hasn't been easy for Hilary Brand. Even after she seems to have reached the top, troubles abound: her business in China, always fraught with problems, is in peril; and her arch‐nemesis Haskins Gould – once her closest business associate, but now her greatest enemy – is gaining traction in his unceasing determination to destroy all she has created. Hilary's two daughters – unhappy trophy wife Jennifer and brilliant but troubled journalist Sara – also traverse the joys and terrors of love as they try to tread their own paths in the shadow of such a powerful woman. From the vastness of Western Australia to glittering Sydney and the teeming streets of Hong Kong and Singapore, this is a story of contrasting loves and of a woman of fierce determination… a woman of courage. At 70 years of age, J.H. Fletcher is the prize‐winning author of sixteen novels, published to both critical and popular acclaim in Australia, Germany and the UK, as well as numerous short stories and plays for radio and television. Fletcher was educated in England and France; and, worked in Europe, Asia and Africa before immigrating to Australia in 1991. Home is now a house within sight of the Western Tier Mountains in northern Tasmania. As research for Dust of the Land, Fletcher travelled to a number of places, including Yorkshire and China.